Importante evento oggi presso la sede di Canterbury della University of Kent: Robert Wyatt incontra il giornalista della BBC Gavin Esler per una conversazione pubblica, con momenti di dialogo con gli uditori e di incontro informale per saluti e autografi, e con la presentazione dal vivo di sue canzoni e musiche da parte del gruppo Soupsongs, guidato da Annie Whitehead. In formazione con la leader dovrebbero esserci Jennifer Maidman, Sarah Jane Morris, Cristina Donà, Brian Hopper, Mark Lockheart, Tim Harries, Janette Mason e Liam Genockey. A conclusione è prevista anche una cena sociale aperta a pubblico e musicisti, a sussidio di iniziative in favore di studenti meritevoli. Si inizia alle 17.45, ora locale, alla Colyer-Fergusson Concert Hall. 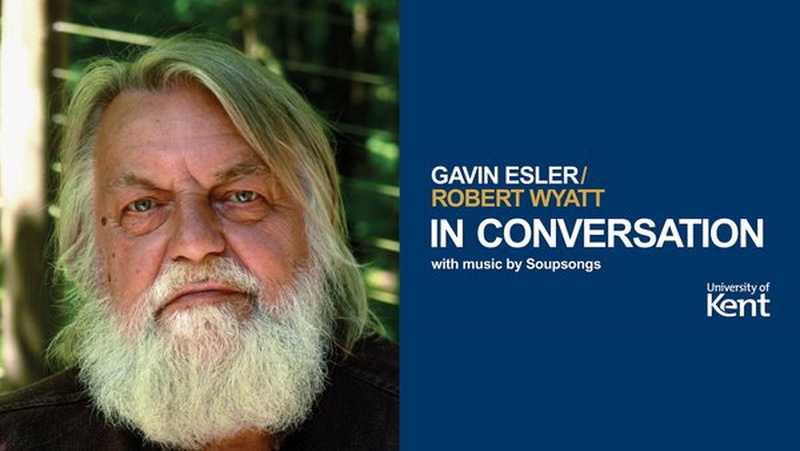 Critically acclaimed musician Robert Wyatt returns to Canterbury to reignite the Canterbury Sound and talk to BBC journalist Gavin Esler about his music career which has spanned five decades. Live music on the night will be performed by Soupsongs. Robert himself has not appeared on stage for many years, but he and long-time musical collaborator Annie Whitehead have assembled this exceptional group of musicians to perform his work live. After the talk, there will be a ticketed High Table Dinner with Robert Wyatt and the Chancellor with tickets priced at £50.00 per person, which includes a ticket for the talk/live music performance. The ticket price includes a pre-dinner drinks reception, a three-course dinner with coffee and half a bottle of wine per person. The dinner will take place in Rutherford Dining Hall. Money raised from the sale of tickets for this part of the event will go towards the Kent Opportunity Fund. Wyatt's hit the Canterbury music scene as drummer for the The Wilde Flowers. In 1966, he founded Soft Machine, who punctuated by Wyatt's distinctive drumming and vocals, the band attracted a massive following across Europe. Two critically acclaimed LP’s followed with Matching Mole, before releasing his award-winning album Rock Bottom and two chart hits - his 1974 re-working of 'I'm a Believer', and the 1983 Falklands War indictment 'Shipbuilding' written especially for him by Elvis Costello. He was curator of the Meltdown festival in 2001 and his 2004 album Cuckooland, featuring Paul Weller, Brian Eno and David Gilmour, was shortlisted for the Mercury Music Prize.